In today’s world of digital natives and tech savvies kids are much keener on various gadgets that incorporate many different interactive features and on the other side this can be quite challenging for parents who always weigh the positive and the negative influence of the technology on kids and often ask themselves what is the right time to introduce technology to them. Nowadays we want to purchase one product that can serve for many things and if you are in a search of a product that has some entertaining but also educational features and can introduce your 4-year-old to some technology, but still you want to have a parental control over it make sure you read our review on the product that we have chosen specially for you and this is another great product that comes from a very well known company VTech. The product is called Kidizoom Smartwatch DX2 and it is a kind of a smartwatch that has the basic function of telling the time but also features other many interactive options. 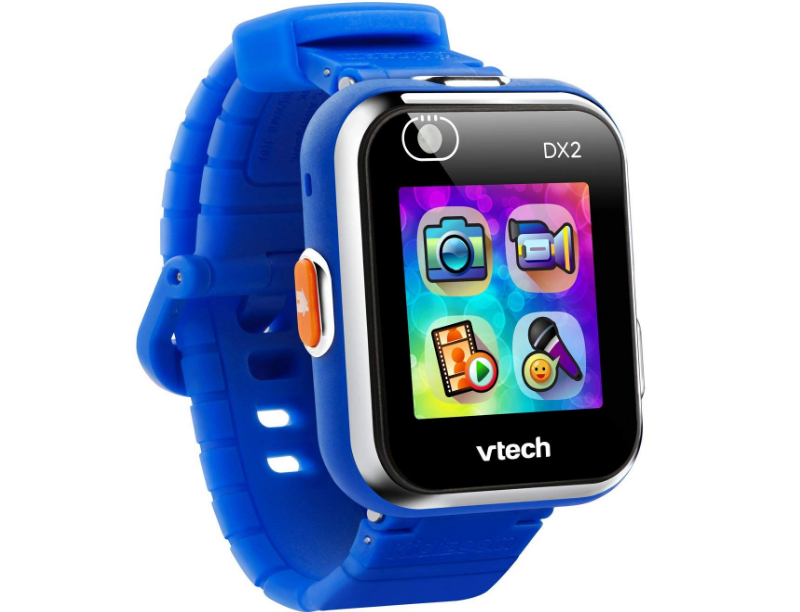 VTech Kidizoom Smartwatch DX2 can come in Standard Packaging and Frustration-Free packaging and the packing is pretty big when you know that there is only a watch inside. When you open the packaging there is a smartwatch inside together with a USB cable and some VTech instructions that considering all the smart things this watch can do, we strongly recommend you read. The watch is operated on rechargeable battery that is not replaceable and can be charged by using the already included USB cable that you can plug into your PC or laptop and connect to the watch for charging. The product dimensions are 0.6 x 8.8 x 1.8 inches which means it is not a tiny watch and the product weighs around 12.8 ounces. What is more important is the display of the watch that comes in 1.44 inches. The screen works on touch and displays in color. There are two cameras on the watch -one front camera that is on the display and it is used for selfie and one side camera on the side of the watch. On the back of the watch there is a button for power on and off and in order to start the functions of this watch first you have to switch this button on. On the right side of the watch there is micro USB port where you can connect the USB cable for charging the watch or transferring or downloading files once the watch is connected to the computer through the USB cable. Right next to this port there is another button that if pressed it launches the camera with two options: to take photos or record videos. On the left side of the watch there is a HOME button that is used for displaying the menu and choosing among the different functions. The clock is displayed on the screen and there are many 3D clock faces to choose from as well as a sound mode that can be on or off. The settings of the smartwatch such as brightness level, sound and many other can be adjusted according to your requirements. The product is intended for kids who are older than 4 and has an age limit up to 9 years old. Older kids than 9 years can definitely wear this smartwatch but knowing that today’s kids are tech savvies and digital natives we think that this watch may appeal as a little childish to them. 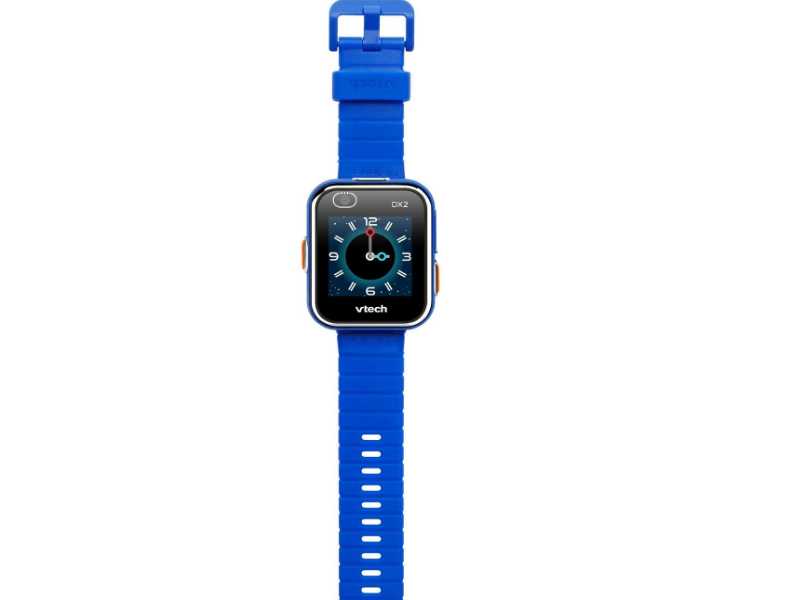 Young kids in the recommended age group will definitely be more than thrilled with this smartwatch as a gift. It is a product that at the moment can be purchased in two different colors that is blue and pink so your kids can choose their color. Both girls and boys love this toy created by VTech because of the many super cool things that they can do with it. The belt of the watch is easily adaptable for the different sizes of kids’ wrists so you do not have to worry about it at all because this watch can grow with your child and kids can use it for a longer period of time. The product features two cameras that has options for taking photos and recording videos. You should press the shutter button on the right side of the watch to start the camera and then you can just press the screen on the shutter icon to take a photo. Just like the standard smartphones you have an icon to switch the camera and choose if you want to take a photo or a selfie.What you should have in mind is that if you opt for selfie you have to take the watch off the hand while taking photos with the side camera does not require taking off the watch. The option of taking off the watch when taking selfie is a kind of con for this watch especially knowing that we are talking about preschool kids (4-6 years old). The camera features 0.3 mega pixels and it produces photos in format of JPEG in 640 x 480 resolution, which considering that this product is intended for kids and its basic function is a watch, is pretty satisfying camera. In addition there are many photo frames, funny photo effects and filters just as in the cameras of the mobile phones and all these features are extremely attractive to kids who love taking photos and experimenting with all the effects and frames. If you want the watch to display all the frames you should press the star icon.The smartwatch has an internal memory of 256 MB which approximately means that you can store about 1500 photos but of course this depends on other circumstances too. When there are too many photos you can always connect the watch to the computer and transfer all of them in order to release some space. If you want to record a video you should tap the icon for recording. The focus range of the video shooting is about 1.5 feet and the videos are stored in AVI format. The resolution of the video can be 320 x 240 pixels or 160 x 120 pixels and the first ten minutes of shooting the resolution is 320 x 240 pixels and the next 20 minutes the resolution is lower (160 x 120 ). Each video can last only 60 seconds. There are also different video effects that you can choose from, when shooting the video. If you want to have a look at the video or at the photos you just have to tap the Playback icon on the screen and use the arrows to navigate through the videos or photos. There is even an option for viewing the photos or videos in a slight show. The options for video and camera are much explored by kids, cause they love taking photos. The watch features three games that kids can choose from and play. These are Mousy Maze where kids have to release the trapped mouse in a maze and collect cheese for it, Ancient Adventure where you have to run as possible in order for the caveman to bring food home and Puzzle Swap where you have to sort out puzzles to make a photo. Some of the photos that had been taken and stored on the watch can also be designed into puzzles that you will have to solve. Kids at 4, 5, 6 years will love playing these games especially the game that is new and interactive called the Monster Catcher. There are two modes in this game: Hunting Mode and Exploration Mode. There are more than 60 monsters that you will have to find and catch. In the hunting mode you can watch the surrounding in black and white and through the side camera while walking around, you can point the camera to different items to see “monsters” in different colors and to take a sample of them by tapping on the screen. In the exploration mode of the game one icon of a man who is walking will indicate that you also have to walk in order to reveal the monster and there is even a distance shown between you and the “monster’. There are many different levels of the game and there are also some “rewards” that you get for winning or reaching certain level in the game. Kids love this game as it is interactive one and feels real because you actually have to walk around in reality. In addition there are also other three games under the name of Noodle Booster that are controlled by tapping on the screen and the common things for these games is that they are all logic games. You will have to logically sequence balloons and tap them in order of appearance, tap the one image that is different compared to the other three or follow the arrows in order to find the treasure. All in all, the entertainment features of this smartwatch are exceptional since it offers a variety of games that can be played and we are sure that kids will find their favorites among all of the offered options for playing the game while wearing the watch on the wrist. 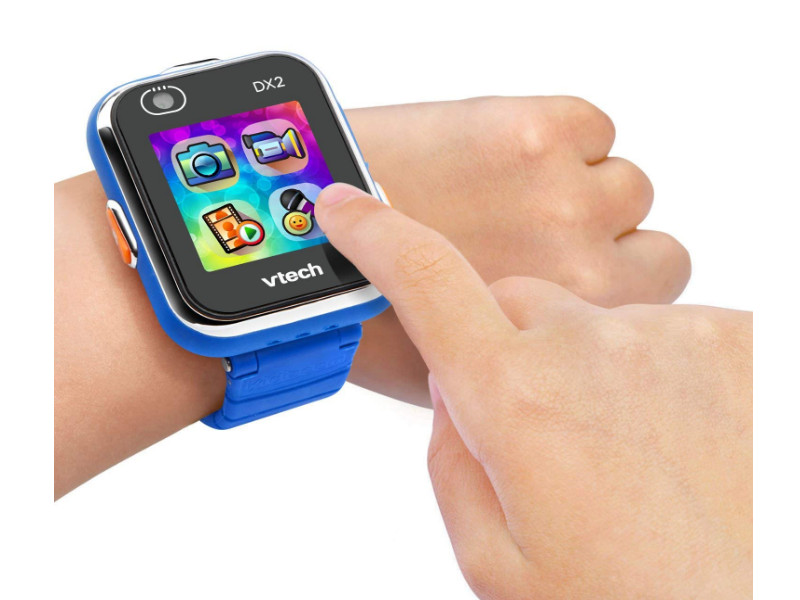 VTech Kidizoom smartwatch has an option for voice recording where you can record your voice for 1 minute. In addition you can add some interesting effects (there are total of 5 such effects) that change your own voice. After the recording you can save, store, listen to or afterwords delete the recording. It is a fun activity for the kids especially because they can apply certain effects to their voice and they would love experimenting with this feature too. In addition to the sound features there is another option for fun. There are approximately 10 sound effects that accompany certain movement. You can choose among the 10 sounds and start shaking the hand and doing some movement. Some of the sounds that are mentioned is that you can choose the sound of walking dinosaur so you can start walking and be accompanied by this sound or start running and be accompanied by the sound of a racing car. There are many different fun elements, effects and options that kids can choose and have a great time. Besides playing different types of games for entertaining yourself, this smartwatch offers you a possibility to get active and start moving, dancing or jumping through three activities all compiled under one name Action Challenge. There are different types of challenges that you can choose by tapping the arrows. One option is to run fast and compete against a character that you choose or maybe do the same but this time instead of running you can choose jumping. You can choose different timing for running or jumping and press the stopwatch to start and finish the run or the jump. If you like dancing you can select this icon for music, choose a song and start dancing together with the character that is displayed on the screen that will try to imitate you and actually dances in his moves. The watch also has a possibility for Pedometer which counts the steps of the kid and all the movements and automatically it is terminated at the end of the day or whenever you tap on the Stop. However, the company declares clearly that this may not be so accurate as the pedometers which are designed for adults and it is mostly designed with intention of fun. Parts of the interactive features is the centre of learning that you can access by registering online on VTech Learning Lodge and you can download and install the software. For more information on this option you can go to the web page vtechkids.com/download. Since this is a smartwatch of course it has many interesting functions regarding time. If your kid does not know how to tell the time this smartwatch is a great tool to teach him/her. The watch has a “Time Master” option where if you tap the clock you can hear an owl pronouncing the time in analogue and digital modes. The only option of language is English. If you want to practice more times you can tap any hour or minute and the owl will help you by pronouncing and saying the time. There are more than 55 clock faces and many more that you can download online and all of them can be customized and appear in analogue and digital format. 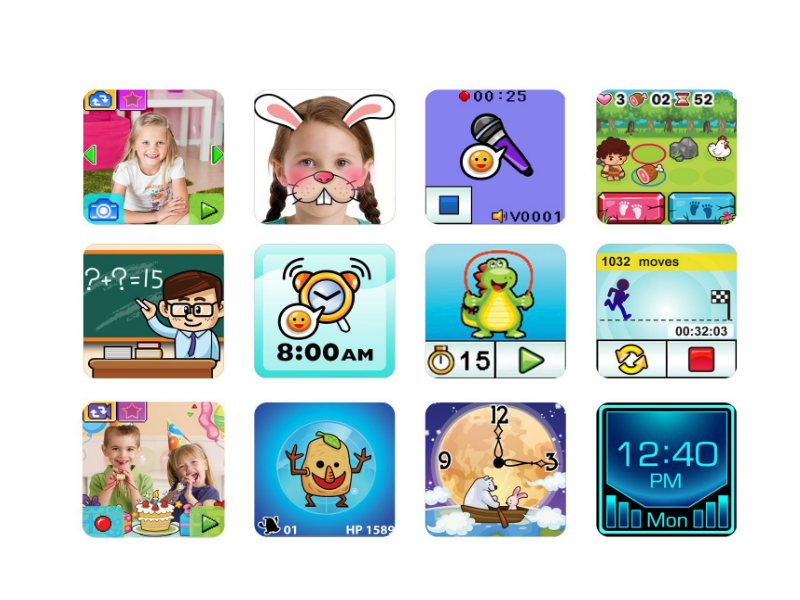 The VTech smartwatch also features an Alarm option, Stopwatch that was already mentioned in some of the activity games, a Timer and a Calendar. All of these options are great tool for teaching and talking to kids about time, seasons and months. One other very useful and practical thing is the option for Parental Control. If you think your kid is addicted to playing games and spends much time on playing you have an option to disable the games for example when the kids are in school or if you want to make sure that kids do not spent much time you can set a time limit, which when reached, kids will have no access to playing games. There are four options to limit the time per day: 15, 30, 60 and 90 minutes so after you set the limit you can be sure the kids will not be on screen all the time. The manufacturer mentions that this smartwatch is “smash proof for everyday play” which means that it is not water resistant and kids should not wear the watch while they are swimming or having a bath since there is a USB port as well as the watches are battery operated. The wristband of the watch is made of rubber and you should clean the watch with a slightly damp cloth and the lenses with dry cloth. VTech gives official time for the battery life and certainly certifies that the battery life will depend on how much all the functions of the watch are being used. The more frequently you use the watch the faster the battery drains. The company says that if the watch is not used often then the battery will last approximately around 2 weeks, if it is a normal use it will last around 2-3 days, but if the kid uses the watch a lot then the battery may last only one day. However, you should not expect much from the battery life cause at the end of the day it really depends on how you use the clock and the length of time as all the other electronic devices. In order to save battery the screen can automatically shuts off when not used and when in clock mode. This is a great product that offers so many options for kids from 4 to age of 9 and you can purchase it online on Amazon for a very mid-range price. This product is definitely worth the price because your kids will surely love it. This is not an ordinary smartwatch since it is specifically designed for kids aged 4-9 and can help your kid learn how to tell the time, but also offers games to be played, interactive activities that kids can do with the help of the watch. It can also serve as a camera, video and sound recorder and an alarm clock. Although it counts the steps it would have been great if this product offers option for GPS like some other smartwatches so you could have actually locate the child. If this option was available we are sure that it would have been almost the perfect product in this field.